We’ve just released a major update for Displays, our new app to manage monitors. This version 1.2 comes with a lot of new features and fixes bugs reported by users. And now, Displays speaks Italian too. When doing presentations or demos, you don’t really want to show the mess on your desktop to your audience, isn’t it? Now Displays can quickly hide all icons sitting on your desktop, on all screens. Use a custom keyboard shortcut or use the appropriate icon in Displays toolbar. No need to open the Grab tool of OS X! You can now take screenshot of the desired screen. There are two settings available in Preferences: take screenshot after a countdown of 3 seconds, and capture mouse pointer. Night mode does have a new setting to reduce blue light emitted by your monitor, which is known as a potent suppressor of melatonin. 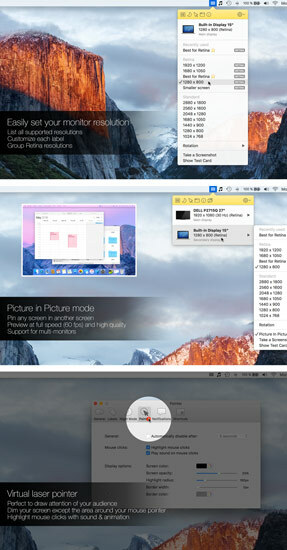 Picture in Picture (PiP) is a cool feature to show a Mac OS X screen in another screen. PiP windows can now be freely resized, without any quality loss. We’ve also added two new user settings to define window opacity and stream quality (up to 60 fps). A Test Card can be displayed on any screen to help you in monitor calibration. You can show resolution aspect ratio in main list. Displays can be purchased on the Mac App Store for 5.99$.